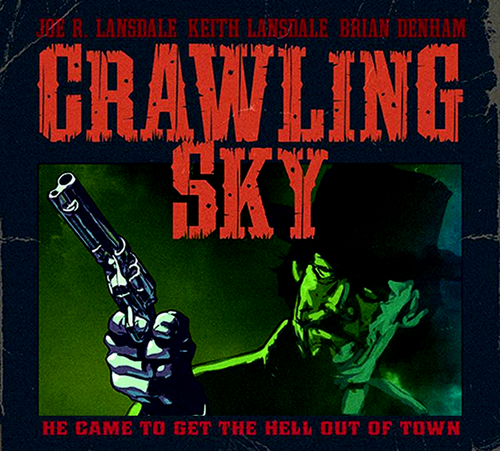 “There are monsters on the other side of the veil…a place you and I can’t see.” – Joe R. Lansdale, The Crawling Sky. Though it is a short story, Lansdale manages to pack more tension and dread into this ominous work than many other authors do with fully fleshed-out novels. Here we’re introduced to nineteenth century middle America as the imposing and mysterious figure of the Reverend Jebidiah Mercer arrives in the repugnantly named municipality of ‘Wood Tick’, or as Lansdale notes, it “…wasn’t so much a town as it was a wide rip in the forest.”. This is a small struggling community run by an ogre of a sheriff who keeps what he regards as a village idiot shacked up in a barred wagon for the local kids to throw stones at. After emancipating the alleged half-wit, Norville, Mercer becomes intrigued by Norville’s tale of a cabin he once inhabited and a nearby well in which he is convinced holds the key to the horrific events he recounts. The mismatched pair embark on a journey back to the property in question, driven by Mercer’s understandable preoccupation with all things ‘unholy’ and guided by an increasingly apprehensive Norville, a man who asserts he is “no bowl of nuts”. To say more of the narrative would be unfair to the reader, given its brevity, but Lansdale’s tale is a genuinely creepy affair made all the more effective by his economic prose and careful handling of the plot. Leave the lights on for a while after finishing this. Yeah, I read that in Deadman’s Road, which is a collection of Mercer stories. I give it a review in my look at the whole anthology. not sleeping. about to read this one.